A Bride’s Ride connects brides with vintage cars for you to rent on your special day! 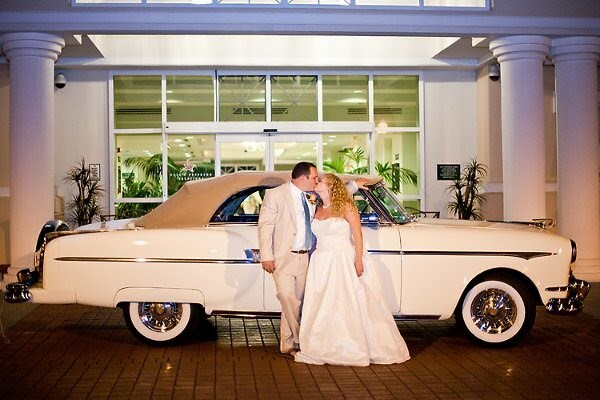 A Bride's Ride connects brides with our Vintage 1953 Packard Convertible for you to rent on your special day. If you are looking for a vintage car you've come to the right place. For your special day we offer a 1953 Packard convertible which has been featured in The Knot, Southern Brides, Gulf Coast Brides and many other magazines. We have driven hundreds of brides and grooms and cover the area from Pensacola to Panama City Beach, Florida. Our Packard is the perfect color combination of Packard Ivory exterior and burgundy interior. Visit Wedding Wire reviews and you will see the brides love the car and driver. The 1953 Packard convertible will greatly enhance your wedding and provide memories you will never forget. After photos. The booking process is simple when you decide on the Packard. Just give us a call with the following information. 1. What is your wedding date and time of wedding. 2. What is your wedding site. 3. How many hours would you like to use the car. 4. Payment is required at the time of booking and an email receipt with details will be sent to you. The 1953 Packard convertible is a show car kept in meticulous condition and no food or drinks are allowed. We also provide decorating kits that meet the owner's approval for a small fee. Please take a look at the photo gallery to see more pictures of the Packard and decorating kits.